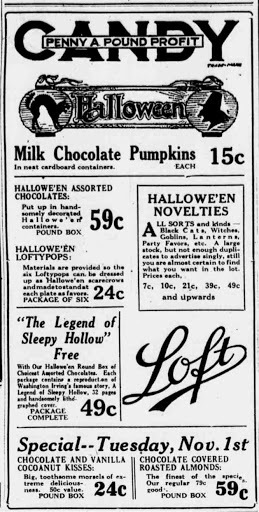 I was surprised when looking through my 1920s reproduction Sears catalog that there were adult-sized Halloween costumes. But yes, adults were wearing Halloween costumes and throwing Halloween parties in the 1920s. Aldwin Bertha entertained a number of his friends Saturday evening at his home at a costume party. Decorations were carried out in the Halloween style and a pleasant evening was spent in games…. Miss Ida Lampaugh entertained thirty friends at a Halloween masquerade party at her home Friday evening. Many clever costumes were worn by the guests. The house was decorated in the season's colors and a dainty lunch was served. The Loyal Workers of the Christian church enjoyed a masquerade party Friday evening in the basement of the church. A round of Halloween games had been planned for the members and a pleasant evening was spent. Refreshments were served…. Miss Evelyn Leypoldt entertained the members of the Senior class and members of the North Platte and Bayard football teams Friday evening at her home at a Halloween party. The Leypoldt home was bewitchingly decorated in Halloween colors, cats and witches. An evening of games and stunts was enjoyed. At the close of the evening a Halloween lunch was served. Fifty guests attended the party.